There have been several beautiful days in March where New England received a fresh blanket of white snow. The kind that you wake up to and the trees are covered, branches drooping, it’s quiet and peaceful out there. Looking outside, it is as serene as the silence of night. It kind of takes my breath away with the beauty of it all! Everything is covered white as snow, and I see the beauty of forgiveness. As I look out at the purity of the white covering, I can’t help but think of the verse in Isaiah 1 that says, “Though your sins are like scarlet, they shall be white as snow.” Clean and spotless, the snow is covering all the grimy grays of the dirt and messiness underneath. It is such a perfect human picture of an amazing story and truth. One that we know as Christians, but if you’re anything like me, I love a good illustration to go along with the promise!! Amen? His promise: Every time that we come to God in humility and ask His forgiveness for our sins of pride, anger, selfishness, unbelief, etc, etc, etc — He washes over us and makes us clean again, “white as snow”. How gracious! How good! Clean is a simple word with deep meaning. It is defined as: 1. free from dirt, marks or stains; 2. morally uncontaminated; pure; innocent. Jesus was the only man fitting this definition. He was without sin, yet He became that spotless sacrifice offered up by the Father to make us “clean” by shedding His perfect, scarlet blood. I was reading in Leviticus recently and though this Old book can seem dry some days, this time I saw with a fresh vision of how incredibly serious God sees sin….AND….how serious he is about forgiveness. Page after page, chapter after chapter, line after line in Leviticus is dedicated to how the Israelites were to “atone” (make amends; compensation) for the various sins they would commit. God made provision for it ALL back then – what animals to slaughter, where to pour the blood, what parts of the animal to burn and what to discard. Even WHO was responsible for performing the offerings was outlined with instructions on how they should dress and behave during the ceremony. I kept thinking of how God recorded every. little. detail. I saw not just how severe the sins were, but more so, I saw how God our Father took the time to lay out the steps to be absolutely sure that those sins were covered, forgiven, washed over, and cleansed. This sinful nature we carry around causes us to trip and fall regularly. However, because of Jesus, we have a “new” way to become clean. The beauty of forgiveness today is that we don’t have to wait for someone to burn a sacrifice for us, or wait for it to snow again! To be made pure and clean we only need to approach His mighty throne of grace seeking his mercy and forgiveness in our time of need. (Hebrew: 4:16) In that verse in Hebrews, we are instructed to come “boldly”, or “with confidence”. That confidence is in Jesus’ finished work on the cross, not in ourselves, and in the promise that He will wash us clean and white as snow again. He covers all our sins giving us a clean slate. Today, once the world wakes up and the snowblowers and plows get moving, the beautiful, white snow will quickly become dirty, gray piles on the side of the road. Kind of like us. We too will get messy and dirty again as we continue on our journey, and we walk back into that world from the forgiving presence of God. I’m so glad we don’t need to sacrifice animals anymore, aren’t you? I don’t think I’d be very good at it. Jesus paid it all for us, took it all, His love covering a multitude of our sins. 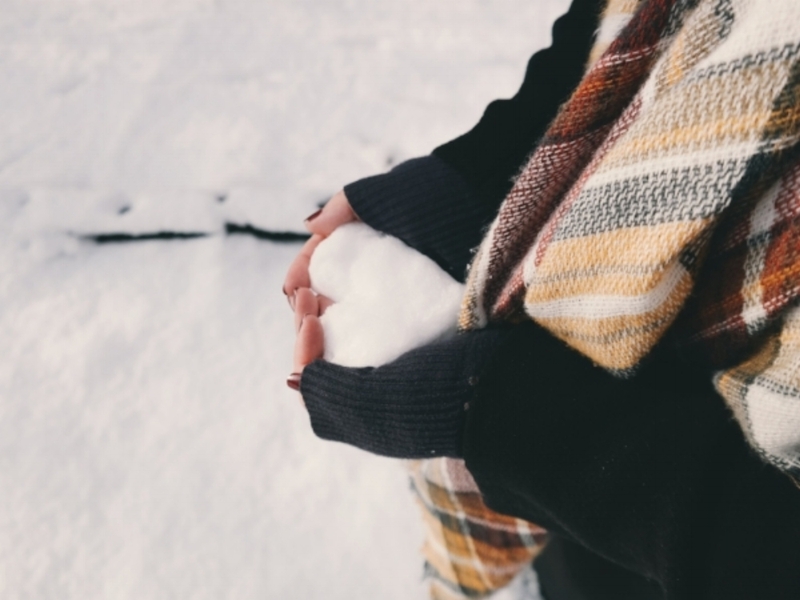 So as I look out the window and see the pure, white of the snow, I see what God sees when He looks at me – all my sins are covered with the beauty of forgiveness. We are blessed. Jenn is a women's leader at Calvary Assembly in Lynnfield, MA. Hey there! Up here in New England, I’m a homeschool momma of 4, wife to my “Mr. Right”, and lover of my Jesus. I love sharing ideas that simplify your life, refresh your heart, and remind us all that we are not alone on this journey. The battle lies in the division of who we are privately and who we are publically. As much as we desire to be wholly undivided, most of humanity will be drawn into division. It's part of our nature. Yet, in Christ - fragmentation, this brokenness can be mended into a beautiful wholeness. It's only possible with Christ in us. Wholehearted. What does it mean to be wholehearted? Over the last several years, I have learned and studied wholeheartedness. I have looked at it from the perspective of qualified authors, Spirit-led counseling, and - mostly importantly - from the Word of God and trying to learn the heart of our Father. Scriptures like these give us a glimpse of what biblical wholeheartedness could look like. Sincere devotion is just simply devotion when not integrated with authenticity. Free from all reserve and hesitation is not possible without inward transformation. Is it? It’s as though, it’s a “this must proceed that”. To live wholeheartedly, we must be wholehearted. Rather to live and be wholehearted, we must welcome and invite the transformation of becoming wholehearted. I think of people like Paul, Naomi, Ruth, Esther, Mary, Peter, Moses, Abraham, and David. And so, so many more. Men and women who lived their lives fully devoted to Christ, not through perfection, but rather through brokenness and mess. These people were a hot mess. Much like you and me. But in all of their hot mess, they devoted everything to Christ and the people around them - in vulnerability and in passion. God calls us to community and impact. Yet, we certainly cannot make a fully loving impact when we are withholding and withdrawing from others. Whether it be out of fear or insecurity, whether we are fully convinced we are not good enough - or simply uncertain about our purpose. I truly believe God calls us to live vulnerably and authentically as we passionately live out our purpose for Him and through Him. We do this in community with God and others. To be wholehearted, to live wholehearted - we must be made whole. Don’t misunderstand, by no means do I mean we must be perfect. Perfection is not our aim. Scripture states in Matthew 5:48, "be Holy as I am Holy" or "be perfect as I am perfect". Can we really achieve the holiness or perfection of God? No. If we look at the context and meaning of this word “perfect” - the original word is “teleioi” in the Greek which translates as “completeness (fully grown)” in your understanding or in your thinking. Be made whole or undivided. God is made up of three parts, Father, Son, Holy Spirit - yet operates as a whole; much the same, according to scripture, we are made up of three parts - body, soul, spirit. And, God calls us to wholeness. How can that be expressed, lived out? For our specific purposes, we are looking at the question of how can I be made whole - how can I live out wholeheartedness? How can I be transformed wholly and completely in Christ? So often, we allow transformation in the external parts of our lives. We change our habits, we adjust our schedules and diets, we talk better, act better, perform better. Nonetheless, we feel broken - fragmented. Pieces of ourselves remain hidden and unseen both to the community around us, but most sadly to the God who created us. We live fragmented lives. We withdraw and protect - and it is not just from community. We do this from God, himself. It seems silly, I know. How do you hide and withdraw from God who knows and sees all? It’s the beautiful and yet, treacherous act of free will and choice. He will not force himself on us, but He waits patiently for us to open our WHOLE heart to Him - to allow Him to transform us completely and wholly - and to surrender wholeheartedly in our journey with HIm. IF we were to do this, it would change us from the inside out - and as we are changed from the inside out the overflow will be to live fully and authentically with God AND with OTHERS. Living wholeheartedly in community with God and others. What would happen in our families, neighborhoods, churches, and workplace if we were to allow wholehearted transformation that flows into wholehearted community? This is what we hope to look at, focus on, and discover in 2018 with this community of women. Are you in? Are you “wholeheartedly” in? This means we will be committed to sharing our stories. It means we will be vulnerable and honest. And, we will work out our salvation through the gut-wrenching act of God reaching deep inside of us and revealing all of the ways we are broken and fragmented. We will watch in awe as Christ works transformation in the deepest recesses of our soul and spirit, and reveals a beautiful outward life of wholehearted surrender and devotion. We will rejoice and celebrate as we journey towards the beautiful reward of a wholehearted life. We invite you to join us!